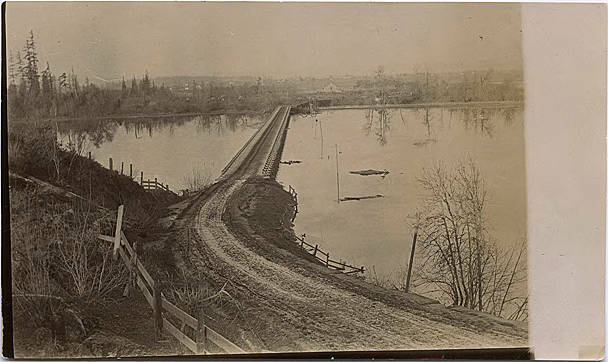 A dirt road leads to a bridge across a body of water. A rail fence runs beside the road and across the bridge. Bare branches of trees poke up alongside the road, and on the opposite side trees, buildings and mountains are visible. Power poles appear to be protruding from the water, which is still and reflecting the trees and foliage along the banks. Highway & Bridge across Jackson Bottom, south of Hillsboro. Bridge across Jackson Bottom south of Hillsboro, Oreg, built in 1905. In 1921, Ex-Judge Goodin was paid $1000 to burn it by putting oil on it. And the dike was made in 1920-21. Picture belonged to Mrs. Elmer Johnson. 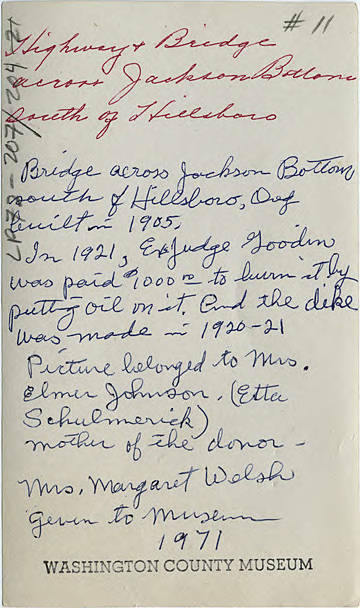 (Etta Schulmerick) mother of the donor--Mrs. Margaret Welsh. Given to Museum 1971.